The in-thread ad position supports the Sponsored Story and IAB Display ad types.. They appear in between comments. Sponsored Story ads will adapt to the color scheme of your site. On light colored sites, in-thread ads will have a white background, as seen in the image above. On dark colored sites, in-thread ads will have transparent backgrounds. If you have the in-thread ad position and the sponsored story or IAB display ad type* selected, an in-thread ad will display in all threads that have 4 or more parent level comments (not replies). The first ad will display after the 3th parent level comment. The 4 comment minimum is so that there will always be at least one comment below the in-thread ad Additional in-thread ads will display for every 6 additional parent level comments. 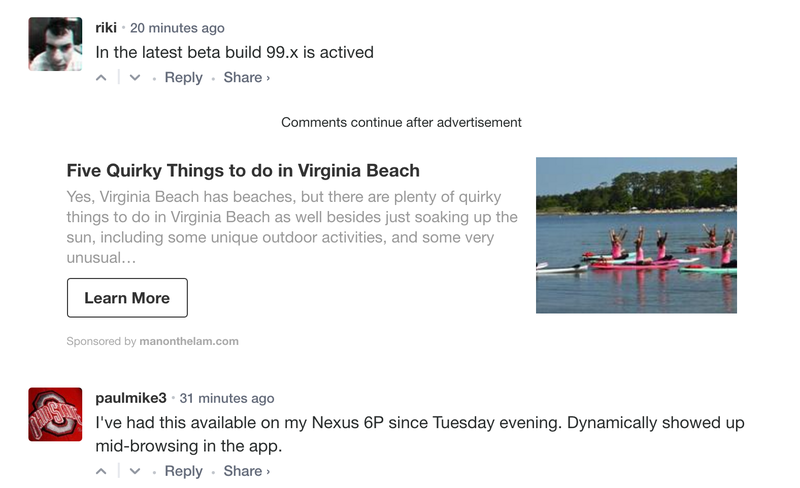 *Sponsored story and IAB Display are the only ad types currently supported by the in-thread position. At least one of these two ad types needs to be selected for in-thread to display. How can I turn them on and off? You can turn in-thread ads on and off, at any time from your Ads Settings page. Can I control which threads it displays on? Not at this time. If the in-thread ad position is active for your site, in-thread ads will display on all pages that have at least 4 parent level comments. Yes, the in-thread ad position will display on mobile as long as all of the above criteria are met. Can I run the in-thread position alone, without any other positions? Currently, we support the in-thread only configuration exclusively for select publishers who are approved by our Publisher Success team. To learn more or discuss your site’s settings, please reach out to our Publisher Success team.